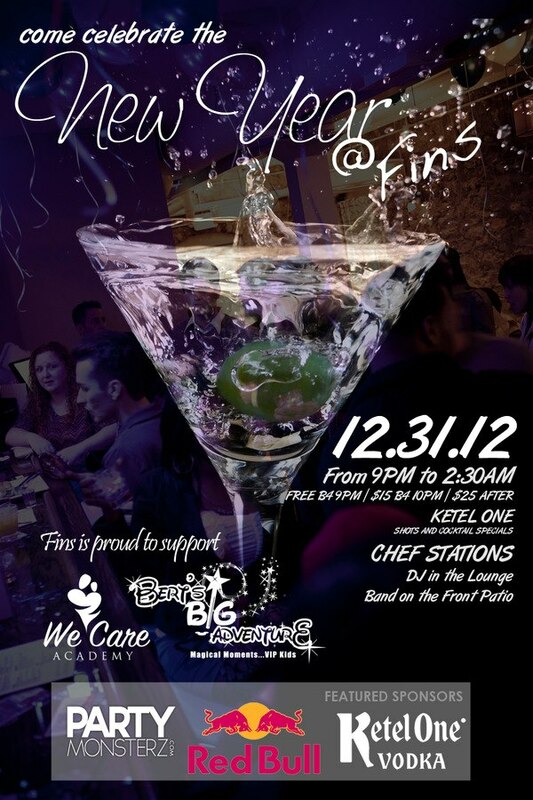 Ring in the New Year with Fin’s Atlanta! Celebrate with. This year we’re going to celebrate a good cause, the work of Bert’s Big Adventure and We Care Academy. All night a percentage of the proceeds will be donated to both organizations. The sponsors are REDBULL and Ketel One. DRESS CODE: ENFORCED NO HATS/CAPS, NO PLAIN T-SHIRTS, NO ATHLETIC GEAR. Enjoy Cocktail Specials “Courtesy of Ketel One” and Chef Stations. Limited VIP Section (Bottle included) available starting at $175. For more information please contact 404-565-2998. Limited Complimentary Valet Parking So get to Fins EARLY. Sounds Provided by DJ Don Julio in the downstairs lounge with Chip McGuire Band on the patio playing your favorite Cover Songs. There is no cover charge before 9pm and admission is $15 before 10pm, $25 after.